By popular demand, I am finally sharing with you all how I pack for a two-week trip in just a carry-on suitcase! I've received so many questions from you all about how I do this for our European adventures, and it's become my guidelines for packing for every trip nowadays. In order to do this properly, you need to make sure that you have an approved size carry-on suitcase for your flight. I've run into a couple airlines that will say my carry-on size is too large. I recommend getting one that has a hard outer shell to protect against dirty surfaces and accidental drops when being moved throughout the airport. When you're packing for this sort of weather, you want to make sure you have multiple layering pieces. My #1 tip in this department is to stick with neutral colors! They are so easy to mix and match, and they will be easy to wash together should you do a load of laundry abroad (we usually do one load halfway through our trips). I will typically pack 3 jackets - one thick (like a trench or pea coat), one medium (like a moto or denim jacket) and one athletic (this flexible North Face jacket is my favorite!). That way, you have an option for any day of the week, and for the day or night. Now when it comes to blouses, you want to use the same method. I will usually pack 2-3 heavy sweaters, because you can wear these alone or bundled when it's colder. After that, I will pack 4-5 medium weight sweaters (including at least one cardigan), 3 thin long-sleeve shirts, and 2 short sleeve shirts to layer or workout in (we try to workout at least twice during those trips in addition to all the walking/hiking). After that I will set out 3 pairs of pants, usually 3 pairs of jeans since they are the easiest. Then, I will pack one dress - for that unexpected night out or nice dinner that we plan for! Of course, don't forget the basics: underwear, bras, socks and pajamas. If you're heading somewhere that you will be walking most of the day or all day, you need to make sure you're properly equipped with the right shoes. This is the area where I will usually sacrifice my stylish options for those that are functional and classic. I will always leave my house with a pair of loafers; they are easy to transport and very comfortable. In addition to that, I will pack one pair of boots, a pair of sneakers and one pair of low or chunky heels that can be worn on a slow day or for dinner. If you know that a specific pair of shoes in your closet become uncomfortable after so many hours of wear, DO NOT PACK THEM. Now there are probably a few of you that have heard about the "roll" method for packing before. I was a bit skeptical about this at first, until I tried it for our trip to Italy in 2016. It is hands down the BEST packing tip I can give you. If it's done correctly, you can fit twice the amount in a carry-on suitcase than you ever have before. Start by placing your shoes along the bottom of the suitcase - fit them into the bottom like puzzle pieces. Next, roll up your pants and place them into one of the corners/sides of your suitcase. On the opposite side, place your rolled thicker blouses. From there, roll up your medium and light weight clothing and stuff the cylinders into all crevices where they fit. I found this to be extremely useful when placing my very flexible items like thin long-sleeve tops, leggings and scarves - they will be able to utilize the small areas of space that you normally would ignore. On top, you can place your jackets as a cover for all your clothing. I use the zippered compartment in the top of my suitcase for belts, underwear, bras and socks. One thing to keep in mind when traveling is to pull out your bulkiest items and WEAR them to the airport. For example, I will wear a pair of leggings, either my boots or sneakers, a sweater and jacket to the airport so that it's less room in my suitcase. Should you wish to change at the airport to wear different layers on the actual plane, you can always do that! I pack a small weekender bag as my personal item for the plane that has my beauty products (I'll do a separate post on the best travel-size ones that I pack each trip! ), a small handbag (flatten this on the bottom of the weekender and pack the rest on top) and then my entertainment items including headphones, books, iPad and more. There are so many different tips and tricks that I could pass along to you all with this, more than I can probably wrap up into just this post. If you ever have any more questions about this topic, feel free to comment below or shoot me an email! I may end up doing a video tutorial of this later on to really show you all how it's done. My dad always made us travel in a carry on to Europe in college that it's something I've carried with me as an adult!! Love your picks and ideas! I love these tips, Bri! Something I definitely need to try implementing for travel, because I am such an overpacker! 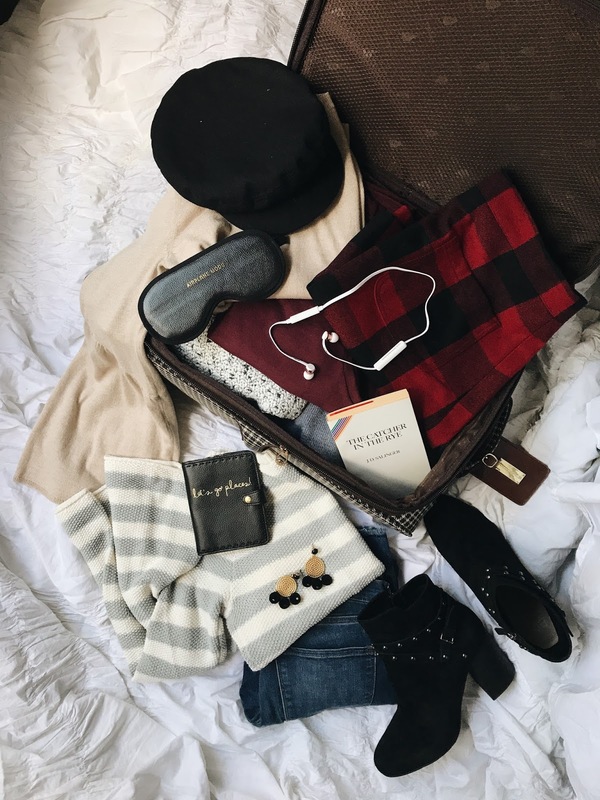 I travel often and this is so helpful because I find that I'm always over packing! Thank you so much for the tips! Love these tips!! I need to get better at packing for trips- especially this time of year! One thing's for sure.... a wardrobe is nothing out with a good set of essentials! While I did know this I still have such a hard time when it comes to packing for trips, thanks for this guide, it's oh so helpful! Great travel tips! I love those earrings too! I need to do this sooner than later! I am accumulating too much stuff!! I love this post! Definitely saving for my trip! layering is my favorite way to dress up or down an outfit! Having a "neutrals based" wardrobe is helpful when packing, that's for sure!